Extraordinary things happen in our little township. In fact they happen so frequently as to be . . . almost ordinary. On my way up to the second ridge to commune with the wolves, which is a whole ‘nother story all by itself, I happened to pass a new construction zone. This is good news, as there has been a paucity of work over the winter. I thought you would like to know. I’ll be keeping an eye on developments. This will give us something to look forward to besides April. I’m almost certain there will be a bear involved. I am interested in all your teases: bears, wolves (run bunny, run) and the igloo are good seasonal thrilling reading! Ahhh, now. A sculpture? We wait with bated breath. My breath is baited (or possibly bated). See? 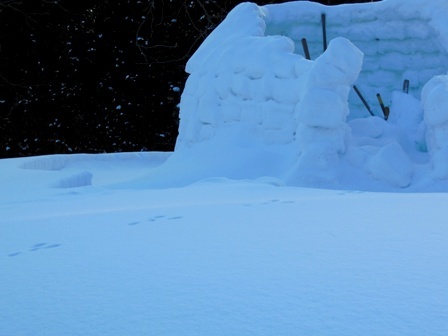 Only up there can you commune with wolves while keeping track of an igloo that houses a bear. And live to write about it. 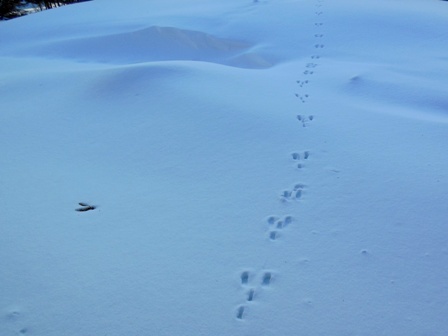 Love the bunny tracks. The construction’s pretty neat, too. Will there be a hot tub, do you suppose? I always tried to build igloos in the winter when I was child. My construction never got so professional looking! Interested to hear about your wolves. Hi Gerry, hope all is well with you and your communal wolf pack. Though I do find bunny trails and new constructions always worth a closer look, I hope winter’s blue hues have been replaced by warm spring yellows in your neck of the woods, as they have here.